I'm so sorry that I stayed away so long. I've been in hiding since the heat index in Austin has been in the triple digits. Confession: I don't even leave my house until the sun sets because this weather is offensive. If it's one thing that makes braving the Texas temperatures of summertime actually worth the sacrifice, it's the opportunity to slay in my new fave frock that you need, too. Scroll to see more! Let's get right to it. You need this dress.💯 If you aren't sold off top, allow me to dish about all the reasons why this stunner is a win. First off, the relaxed straight fit is a forgiving cut that flatters any figure while smoothing out your silhouette real nice like. Sweet details like bell sleeves a low cut tie-back make this dress breezy, beautiful and super duper bomb. If you've been rocking with me for a lil minute now, you know AKIRA is a retail destination that always keeps the heat stocked. The Chicago-based apparel brand offers all the trendiest styles at a price your budget will bless you for. And when it comes to keeping fashionistas laced, this AKIRA dress👗 does not disappoint. Chicly bold stripes and a flirty hem just above the knee add subtle details to this dress for major modern vibes. Styling this dress is v simple. 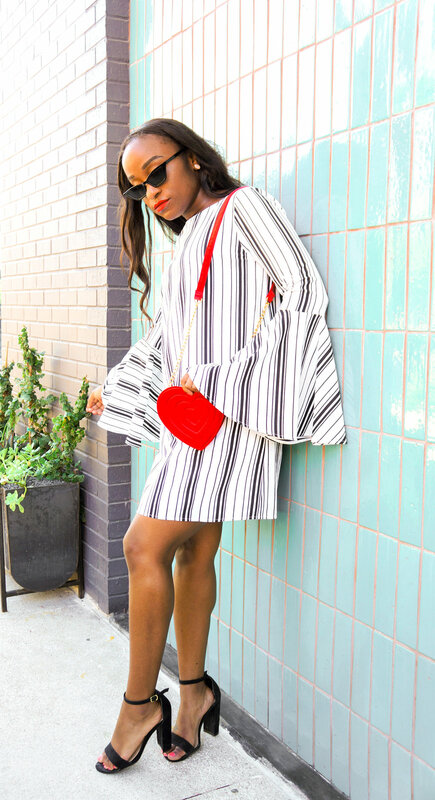 I opted for my favorite pair of black block heels and a cute statement bag to complete the lewk. How cute is this heart bag from Euro brand Monki tho?! Bell sleeves are having a moment rn, sweetie. Allow me to help you rock the trend the right way with a few of my favorite AKIRA selections you need immediately. Still hesitating on adding this lil baby to your cart? I promise it's meant to be, sis!🤞🏾 This dress is a marriage of modern chic style and the perfect amount of playful flair to slay at just about any event you're invited to this season. Turn a few heads at brunch.🥂 Rock your graduation pics. Be the best dressed guest at a bridal or baby shower. Keep it classy at an after 5pm event with friends. No matter where you're headed, this day dress is a winner. Yay for not having to think about what to wear the next time you get an invite! OK bbs, I'm omw to capture more content to share with you super soon! Check back on le blog by Monday to peep a ‼️BIG ANNOUNCEMENT‼️ that I've been dying to share with all of y'all!